Cozy RANCH home with 3 bedrooms and 2 full baths is ready to be your 'home'. The main level has been freshly painted in a neutral color and has new carpeting. Kitchen and Breakfast Room have oak cabinetry, stainless steel appliances, including a refrigerator, new counter, new sink, ceramic back splash, ceramic tile floor, French doors leading to the covered patio and large level fenced yard. Master bedroom suite has a full bath and new carpet. The Lower Level is partially finished with a Rec Room and Family Room. The pool table is to stay too! There's plenty of room for storage. The washer, dryer and freezer are ready for your use. The 2 car garage is over sized, has extra storage and door leading to the back yard. 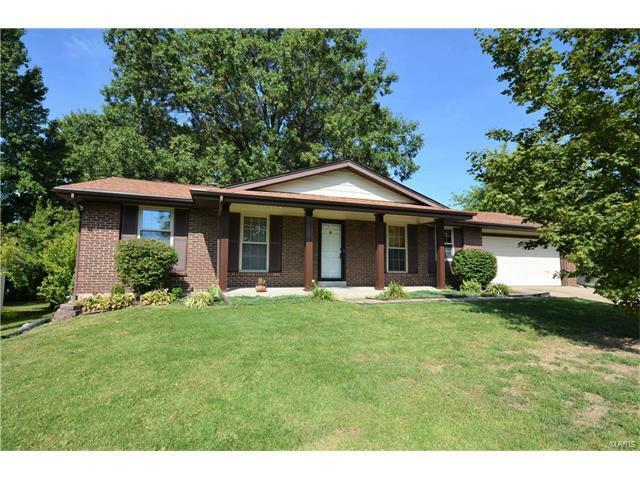 Don't miss out on this move-in ready ranch! A MUST SEE! From Hwy 70 or Hwy 94 take the Mid Rivers Mall exit. Go East on Mexico Rd about 1/2 mile to Country Hills Estates on Left. Left on Cross Trail, first Left on Country Hill to first Left on Greengage. Home is on the Right.